The Confession Machine prints online texts that fade away as time passes, just like the confession itself. The machine prints on a surface painted with an ultra violate sensitive pigment. While passing over the surface, it turns on and off 16 UV LEDs in a carefully timed sequence, temporarily creating dots and dashes on the surface. Those are added into letters, words and sentences. The intimate and revealing printed texts are taken from social networks, showing the lightness of confessions via online channels today. People today willingly share personal details of their lives via the digital medium. At the same time the importance people give to online confessions is small and temporary in its nature. One sees a reviling status, may get excited, like, comment, even share, and forget it. That is the life cycle of an online confession. It is also a paradox as all this personal information now stays on a virtual limbo, forever exposed. 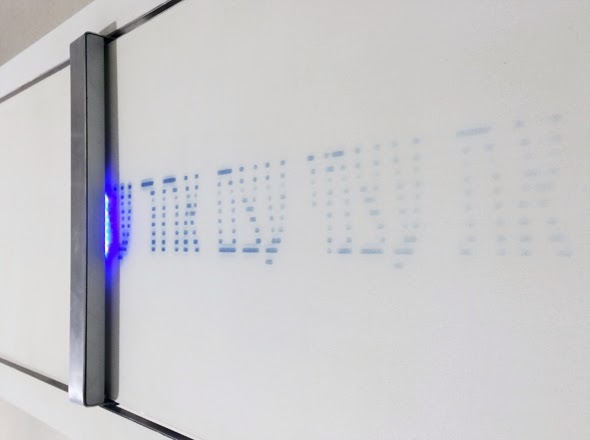 The Confession Machine uses the technology of repeatable writing using light (developed by the Bloomfield Science Museum Jerusalem) to show the temporary nature and lightheadedness of online confessions. A confession is printed and fades away. A new confession immediately takes our attention. Sometime a confession starts fading ever before the entire sentence was completed. The Confession machine was commissioned by Artists' Residence Herzelya, January 2014.